iPad is one another consistent product from Apple company that is selling regularly. This is the reason, Apple always introduces new iPad with new features, sizes and processor. During this year, Apple introduced two new iPad in the market, which is actually an upgraded version called as iPad 10.5 inch Pro and iPad 12.9 inch Pro and again selling well in the market. However, whatever devices we buy these days, they need protection because we don’t want any accidental damages as repair costs are very high. This is the reason, we always try to bring out the collection of best cases and covers to ensure full protection. We even came up with article featuring best iPad Pro 10.5 case. While the market is flooded with various best iPad 12.9 inch Pro cases and covers and cases that will keep your device protected. However, finding the right one is still a daunting task and that is why, we bring you the best of the best iPad 12.9 inch Pro cases and covers that you can select to fit your needs perfectly. All these cases and covers for 12.9 inch iPad Pro are great in terms of design, durability and protection ability. Have a look. Just like the name suggests, ESR Lightweight Smart Case is a very light case which protects your iPad without adding up much bulk to the device. The exterior of ESR Lightweight Smart Case is made up of polyurethane which makes the case very durable. The interior is made up of microfiber, which prevents any scratches on the device and provides a soft covering. It has a trifold cover doubles as a stand which offers a hands-free use of the device. Automatic sleep and wake is supported by the magnetic cover. KuGi iPad Pro 12.9 Keypad Cover is a briefcase style cover. It offers an all-round protection to the device and is lightweight . KuGi iPad Pro 12.9 Keypad Cover consists of all the right cuts so that you can access the required buttons of the device as and when you need it. The cover also comes with an iPad pencil holder in place. It has a 250 mAh battery which is built-in and can last for about 90 hours to support the keypad. It makes the keyboard dormant if not worked on for 5 minutes. 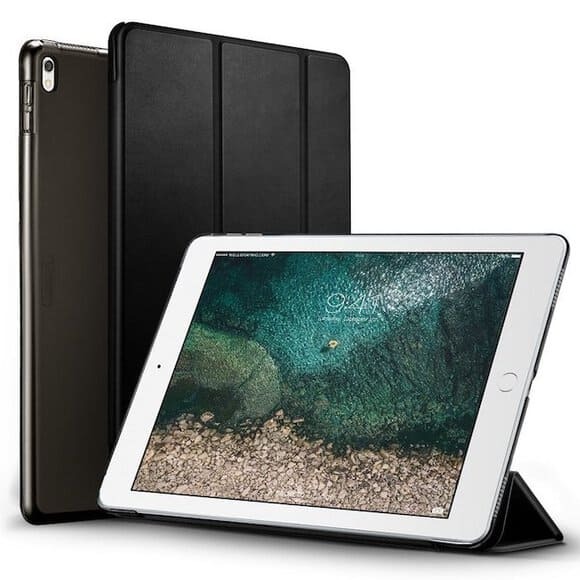 One of the best 12.9 iPad Pro 2017 cases which is made up of PU leather and provides a firm grip and durable protection to the exterior of the device. The interior is protected from scratches by the help of microfiber layer. 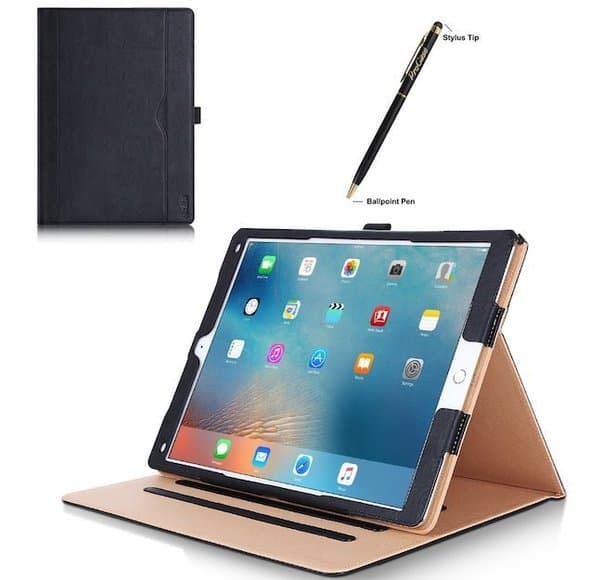 Premium Leather Case for Apple iPad Pro 12.9 is a lightweight case which comes with a stylus holder as well as slots for credit and debit cards. It consists of a magnetic strip cover which helps in automatic sleep and wake up of the iPad Pro 12.9 device. 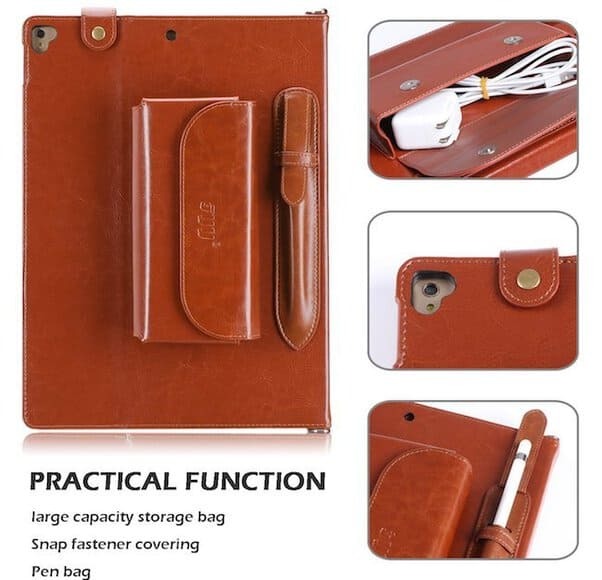 FYY Luxurious Genuine Leather Case is available exclusively from FYY and is one of the high-quality cases for your iPad which is made up of a genuine leather exterior and an interior of PU leather. 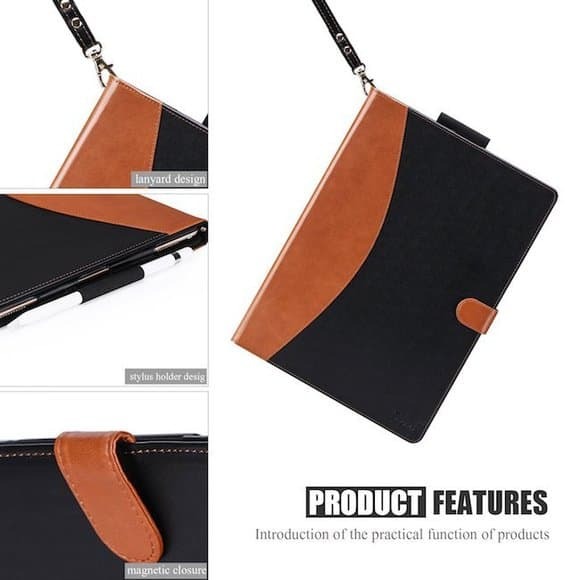 FYY Luxurious Genuine Leather Case comes in two colors for the users to choose from and has a dual design that allows you to conveniently carry the device around. The exterior helps in protection of the device while giving it a classy look while the PU leather interior protects the device from any kind of scratches or fingerprints on the device. 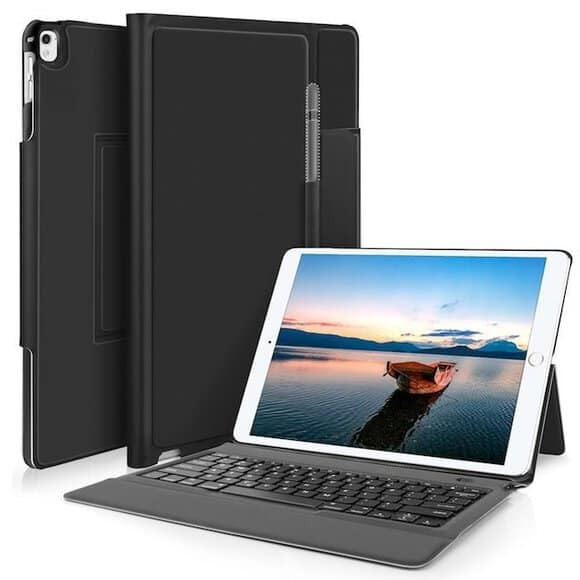 Looking for some unique case for your new iPad Pro 12.9 inch model. 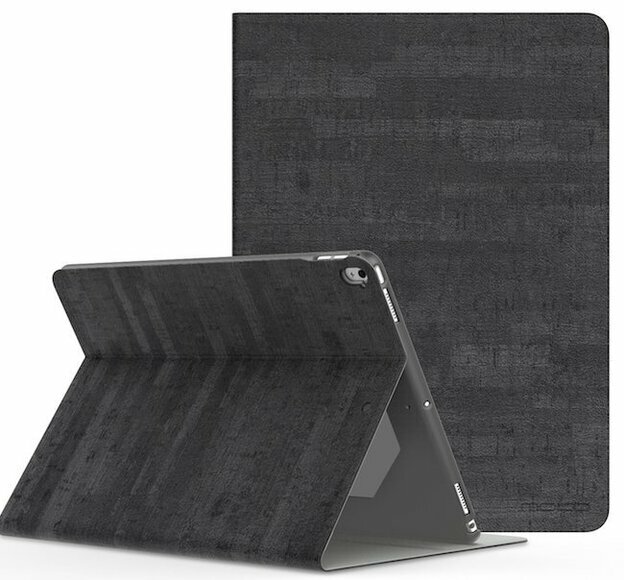 If yes, check MoKo Case for New iPad Pro 12.9 which doesn’t only look fantastic but has incredible features too. This case put the device to sleep or wakes it up automatically when the lid is opened or closed. The exterior is made up of PU leathers which provides grip as well as protection, while the interior is made up of soft material that prevents scratches and fingerprints. It is lightweight and has cuts at the precise positions so that all the required points are well accessible. 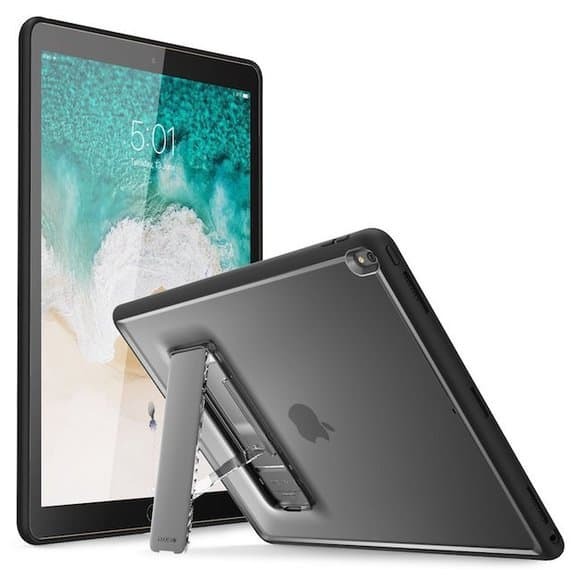 MoKo Case for New iPad Pro 12.9 also comes with a stand. ProCase Leather Stand Folio Case Cover has a unique combination of materials that helps in keeping the device and at the same time makes the device look elegant. The exterior is made up of leather which gives a good grip and at the same time enhances the look of the device. On the other hand, the interior of the cover is lined with soft material which prevents the device from getting scratches. ProCase Leather Stand Folio Case Cover has cutouts in the right places and allows you to use the buttons with the cover on. Some of us are fond of clear cases that allows the elegance of the product to be seen and yet makes a protective layer for the device. i-Blason Premium Slim Hybrid Protective Case is one such cover which keeps the device protected and at the same time doesn’t mar the look of the device. It is a slim cover which doesn’t add much bulk to the device. i-Blason Premium Slim Hybrid Protective Case is made of shock absorbent TPU material and comes with a kickstand which allows the hands-free activity. 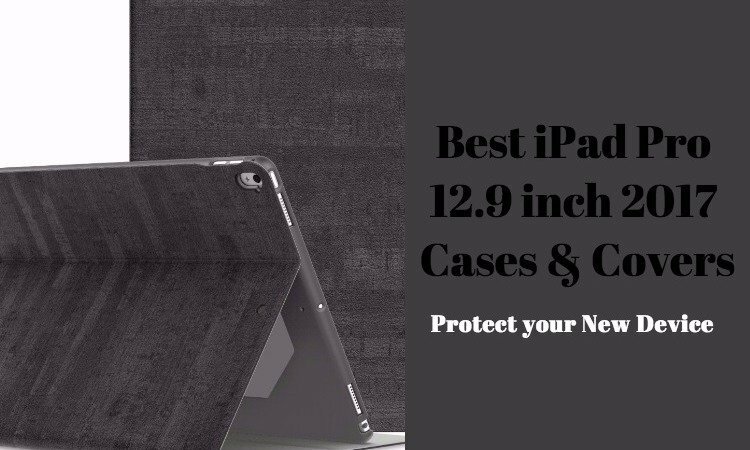 If you are looking for best tough iPad Pro 12.9 inch 2017 case, then this one is for you. SUPCASE Unicorn Beetle PRO Series Full-body Rugged Protective Case is a full body case which is perfect for rugged use as it has a great shock absorbent feature. It is made of two layers which consists of a hard PC shell on the outside and flexible TPU material on the inside which keep the scratches away and absorbs any kind of shock inflicted on the device. 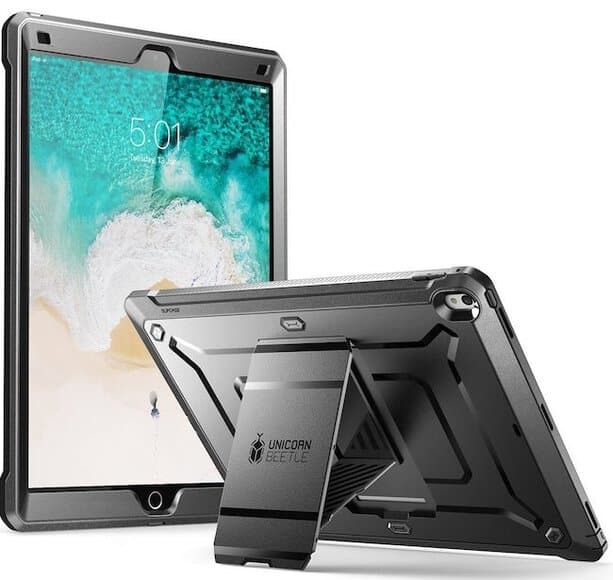 SUPCASE Unicorn Beetle PRO Series Full-body Rugged Protective Case also consists of a pop out kickstand which allows you to watch all your favorite shows hands free. 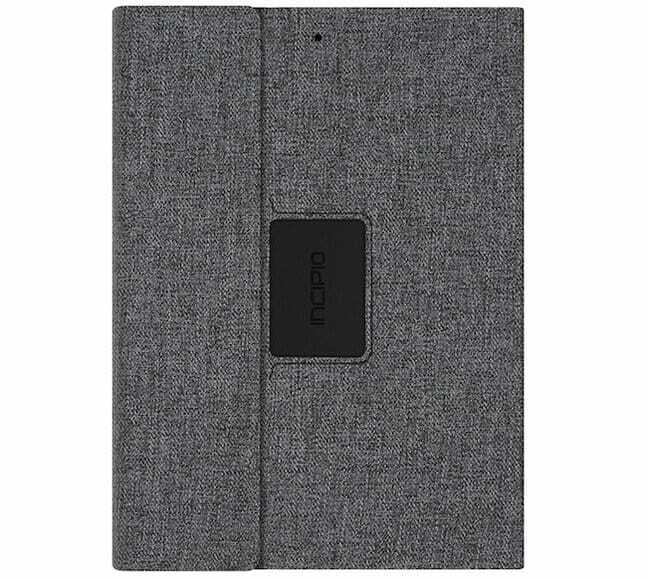 Incipio Esquire Series Folio Case for Apple iPad Pro 12.9 is one of the most durable covers for the iPads which is made of dual materials which are molded together to offer better protection to the device. It has a sleek and stylish design which light in weight and has an ultra-soft finish that prevents any scratches to come on the phone. The shell of the phone is made up of TPU material that is good for absorbing shocks and it also has a kickstand which allows hands free viewing. 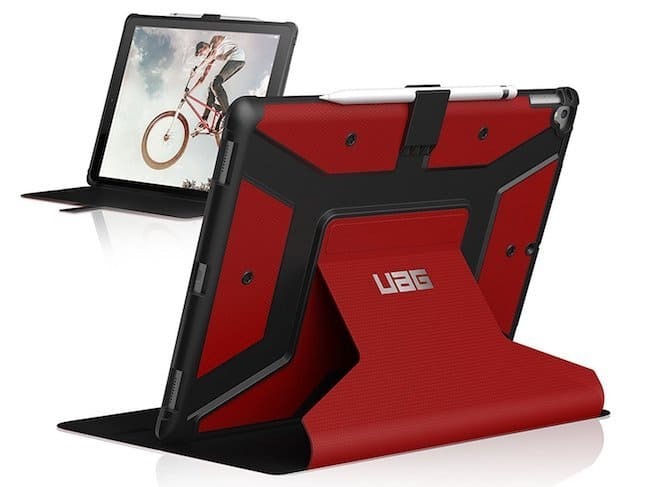 UAG Folio iPad Pro 12.9 Case is a feather light cover for the iPad Pro 12.9 which is made of dual materials. The exterior helps in absorption of shock and drops of the device. The interior is made up of soft material which allows the prevention of scratches that may otherwise be inflicted on the device. The ports and the buttons are well accessible thanks to the well-placed cuts. UAG Folio iPad Pro 12.9 Case has been tested with military standard drop tests and will make the device very safe. The folding stand allows hands free viewing. 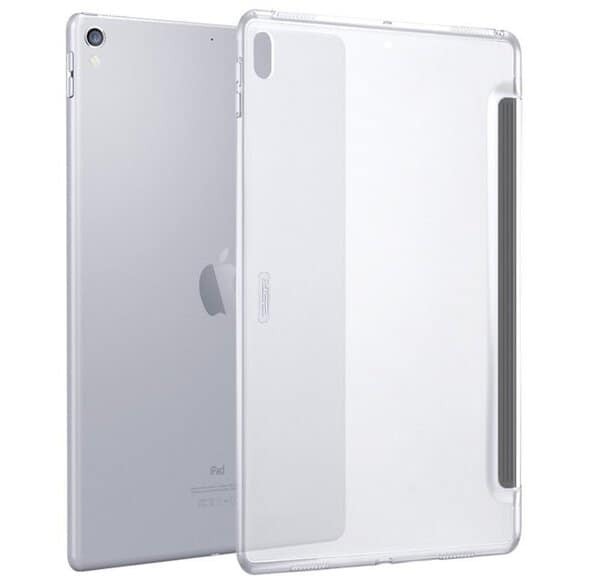 ESR Clear Hard Case is one of the lightest weight hard covers that you will find for your iPad Pro 12.9 inches. It has a black panel design which enhances the beauty of the product and the cutouts makes all the required buttons and ports with ease even with the cover on. ESR Clear Hard Case also has proper ventilation in places which prevents your device from heating up too much. The buttons are covered by FlexPress materials and protects the device from dusts. It is a perfect fit for the device. Last but not the least comes Targus VersaVu Classic 360-degree Rotating Case. It has been tested for drop protection with military grade testing facilities. It helps in 360 ° revolving facilities which eases the landscape viewing facilities of the device. The interior of Targus VersaVu Classic 360-degree Rotating Case is made with luxe which protects the device from scratches. It works perfectly with the smart keyboard of Apple and even has a Pencil holder in place. Targus VersaVu Classic 360-degree Rotating Case has all the precise regions cut out for access to buttons and ports. 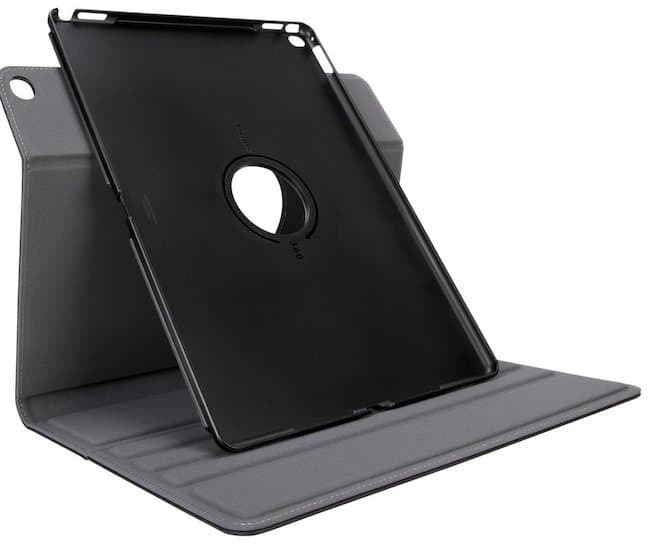 These are some of the best iPad 12.9 inch Pro cases and covers that ensures maximum protection of your new device while adding the Oomph factor too. All these best cases and covers for iPad Pro 12.9 inch not only protect your device from accidental damages, but ensures its safety from dust and scratches. So, what are you waiting for, find the best iPad 12.9 inch Pro cases and covers from the above list and do not forget to tell us which one you chose and why.